Many of these patterns are available as frameworks and you do not need to implement them from scratch. As a side effect, the frameworks, such as O/R mapping and web presentation tools, have a tendency to hide their implementation techniques. The patterns cataloged and described by Martin Fowler will help you understand what happens behind the scene and and use this knowledge for optimizing, troubleshooting, and improving the design of your applications. This book has something valuable for everybody. If you are new to the industry, you will learn about common recurring problems building enterprise applications and study techniques to solve them. If you used these patterns before, you will deepen your understanding of them. Click here to find out more about this book. Happy reading! Last month, I blogged about organizing code in a source control system. We looked at how release units help us represent a domain context map to support domain-driven design and distributed application development. We recommended adopting a standard release unit layout so that your release process can be clearly understood and automated. This month, we will take a deep dive into the release unit's trunk folder. I said before that trunk contains the latest version of the release unit code. How shall we organize our code inside trunk? Each release unit should contain one and only one .NET solution. Now, we are ready to take a look at a sample .NET solution structure that will help you implement principles of domain-driven design and object-oriented programming. For simplicity, let's assume our solution consists of a single web application and a command-line data setup utility. You will have no problems extending this approach to handle your own more sophisticated scenarios. /doc - contains release unit's documentation. /lib - contains release unit's pull dependencies. When your project uses a .NET assembly not part of your solution, place the assembly into the lib folder and reference it from there. It ensures that all projects in the same solution always use the same version of the dependent upon library and provides you with a clear way to upgrade the library to a new version should you decide to do so. /Database - contains database creation and modification scripts, scripts to set up users and their permissions, load data files, etc. This folder may also include command-line batch files to set up the release unit on a local machine, build, integration or test server. 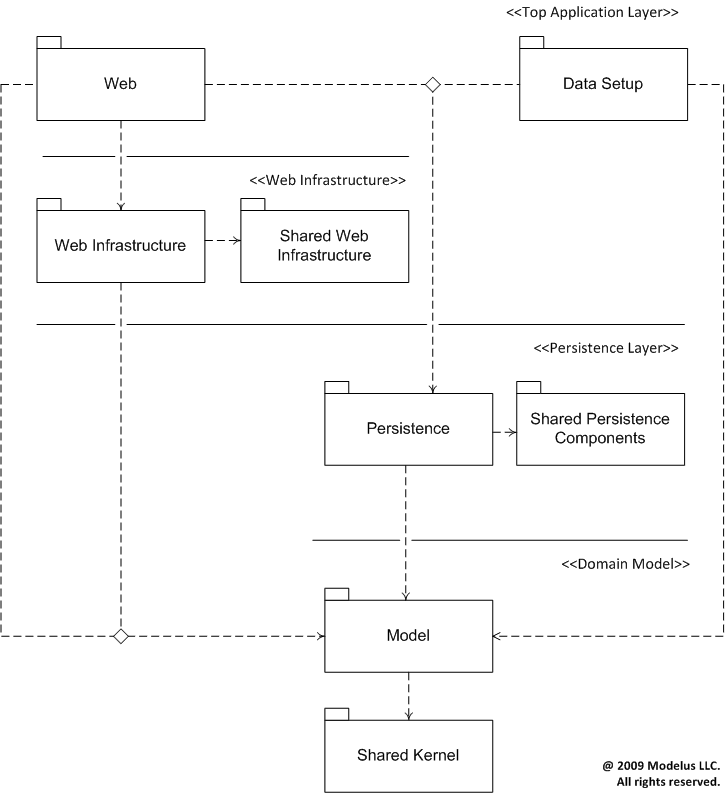 /Model - contains classes of the Domain Model, a central part of the release unit. This assembly describes what can be accomplished by the release unit in business terms. Keep the model free from infrastructural detail. It will help you achieve high levels of reuse and low costs of maintenance in your applications. Next month, we will take a look at how to organize your domain model to clearly identify all supported business scenarios and transactions. This is a big topic on its own, which certainly deserves a dedicated blog article. /ModelUT - contains unit tests for the Domain Model classes. /Persistence - implements a persistence mechanism for the release unit's domain model. I strongly recommend keeping persistence interfaces with the model itself since it shows how aggregates and entities are designed to be loaded into memory. The purpose of the persistence library is to implement persistence interfaces with your standard tools and techniques. /PersistenceUT - contains configuration files and unit tests for the Persistence. In our case, these tests verify the release unit's persistence classes and their configuration files as well as the database. Strictly speaking, they are integration tests. However for the purposes of the domain modeling, we prefer to think about the whole domian model persistence as a black box. /WebInfrastructure - contains web infrastructural classes which would otherwise be placed in the App_Code directory on the web site. Extracting these classes into a dedicated library allows them to be unit tested. /WebInfrastructureUT - contains unit tests for the web infrastructural components. /Web - contains a web application, a top application layer responsible not only for user interface but also for referencing and configuring all its depencies. /WebUAT - contains user acceptance test scripts, such as Selenium or WatiN. /WebLT - contains load testing projects, such as JMeter or LoadRunner. /DataSetup - contains a command-line process to perform backroom administrative tasks. /DataSetupUT - contains unit tests for the data setup components. For each release unit, create a .NET solution file. Place all of your external pull dependencies into the lib folder. Keep your model classes free from any infrastructural detail. Make your top layer responsible for connecting and configuring all its dependencies. Thank you for reading Modelus Blog! No RSVP is need. See more information on otug.org. Katheryn Petersen is put in charge of DecisionTech, a young promising 150-people Silicon Valley start-up, experiencing a series of disappointments: slipped deadlines, lost key employees, and deteriorated morale. With no high-tech experience and a limited political capital with the board, she does not seem to fit DecisionTech's corporate culture. After interviewing members of the board and spending time with her executives, Katheryn realizes that they do not function as a cohesive unit. She dedicates her time, energy, and effort to addressing the issues preventing her executive team from reaching its full potential. Will Katheryn be able to turn things around? Can she meet the revenue goals and dramatically increase the sales? Read this exciting and thought-provoking business novel to find out! To find out more information about this book, click here. Happy reading! One of the first questions facing development teams is deciding how to organize their code in a source control system. In this article, I will describe an approach that we have applied successfully at multiple organizations over the last decade. I hope it will help you and your team make your development environment and processes leaner and more efficient. Our source control system is organized around release units. Release Unit can be thought of as a collection of folders and files that are released (and thus, reused) together. It is a job of application architecture to break down a large monolithic application into multiple release units so that they can be tackled independently by different development teams. We recognize two types of dependencies between release units: Push and Pull. Let's assume that Release Unit A depends on Release Unit B. Push dependency means that every time B is changed, it is automatically integrated with A. Pull dependency means that B is integrated into A when A's development team decides to pull a new version of B into A. An example of Pull Dependency: an application that depends on a shared domain. Even though a new version of the shared domain may be released each month, it does not force the application to be integrated, tested, and redeployed on a monthly basis. Instead, the application integrates with the shared domain only when the application development team decides to pull a new version of the shared domain into the application. An example of Push Dependency: a web application that depends on the portal's header and footer. Every time, the new header and footer are implemented, each web application is automatically integrated with the new header and footer code. Create /lib folder in your release unit's trunk and place all release unit's pull dependencies there. 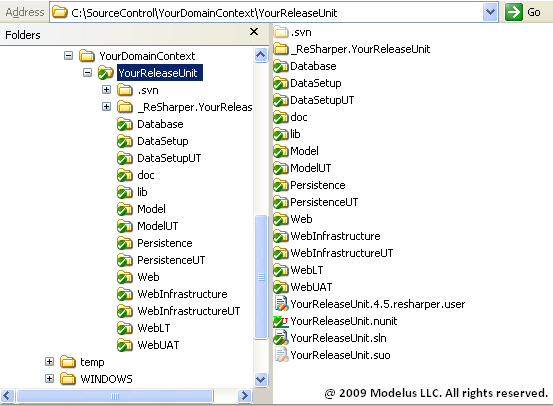 Configure your release unit to automatically integrate with the dependencies placed in the lib folder. Next month, I will demonstrate how to set up a sample .NET solution structure with pull dependencies. Configure your release unit to link and automatically check out or export all its push dependencies. In Subversion, this can be achieved by using the svn-externals property. Even a medium-sized organization is likely to have hundreds or even thousands release units in their source control repository. In order to keep the repository manageable and easy to navigate, group release units belonging to the same bounded domain contexts together. For example, you may have a set of release units stored in the Accounting folder, another set stored in the HR folder, and another set stored in the Finance folder. You will need to refer to your domain context map in order to learn what bounded contexts exist in your organization. Contact me if you have any questions or comments. 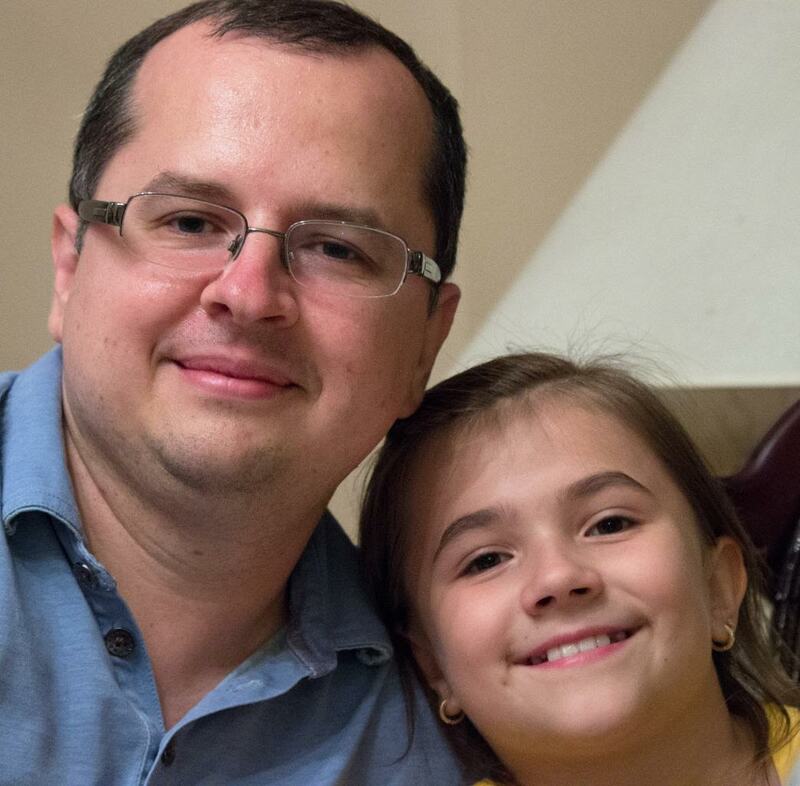 Happy coding!